My husband requested beef brisket sandwiches again this year for this birthday. I realized it was "again" when I found the recipe I'd printed from Food Network and read my note, "made for Eddie's birthday 3-19-11." Guess he liked it. 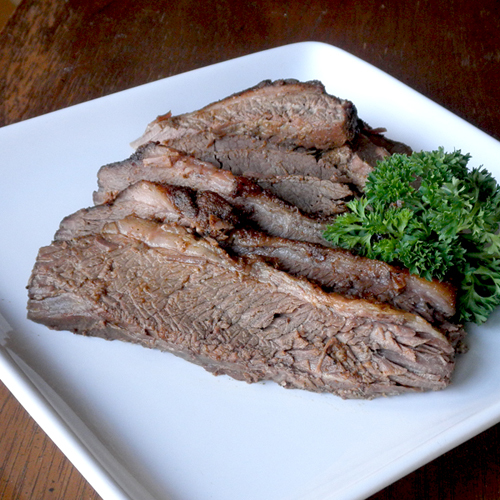 This is a relatively simple recipe that produces a tender, juicy, flavorful brisket. At first I bought a 4-pound piece of brisket, and then the food pusher in me thought it might not be enough to feed the 11 people we'd have here for the birthday celebration. So I went and bought another small piece of brisket, about 3 pounds. Well, it was too much, of course, and now I have plenty left over for leftovers, or for taquitos, or enchiladas. I cut back on the salt and chili powder called for in the original recipe. Click on the link below the title if you'd like to see the original recipe. The way I prepared it created a milder flavor that stood up on its own, or went nicely with a good bbq sauce on a bun. Since I like to use leftovers for other recipes, I don't like the original to have too pungent a flavor. That's just the way I roll. If you're looking for a nice, mild but tasty brisket, I think this is the ticket. Place brisket in a large roasting pan & season both sides with spice mix. Leave fat side up in roasting pan. Roast uncovered for 1 hour at 350 degrees. After an hour, remove from oven & add beef stock and enough water to make about 1/2 inch of liquid in the roasting pan. Reduce oven temperature to 300 degrees. Cover roasting pan tightly with foil and continue roasting for another 3-3 1/2 hours, or until fork-tender. Remove from oven and allow to cool for 15-20 minutes. Slice the meat thinly across the grain and top with some juice from the pan. You brisket it looks very good but I would have rather have smoked it in the water smok smoker to get that hickory taste that you can never get enough. what are you going to serve as a side dish? Thanks, Al. 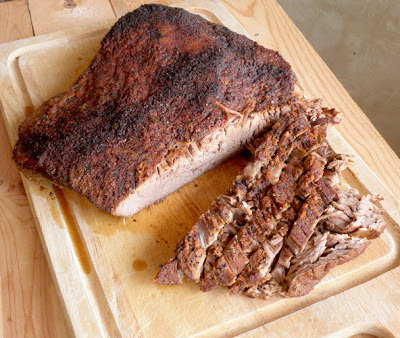 This is a great, juicy brisket for those who don't have smoking capabilities. My husband just bought me a new bbq that I think has smoking capabilities that I plan to figure out this spring break. Ohhh. This looks fabulous. My mom would always make a nice, tender roast beef brisket with mashed potatoes and jello salad for Sunday dinners, so it's totally nostalgic for me. I like to make mine with onion slices and lots of pepper. :) Thanks for sharing!